This summer, Judy Moody, her younger brother Stink, and the rest of their family and friends jumped off of the pages of the bestselling novels by Megan McDonald and landed on the big screen in the feature film Judy Moody and the Not Bummer Summer. I hope the movie inspires young moviegoers - both eager and reluctant readers - to check out the source material. Kids, households, libraries, and schools that enjoy the antics of Beverly Cleary's Ramona Quimby or Judy Blume's Peter and Fudge are certain to find the Moody books delightful. The books, illustrated by Peter Reynolds, have a sense of whimsy and spontaneity that kids will relate to while keeping the text clear enough and the chapters short enough to hold their attention. 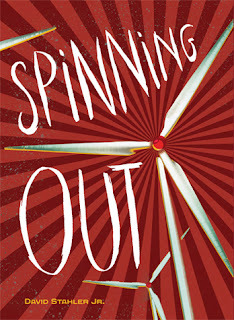 The series, which began with the simply-titled Judy Moody and cast the spunky girl as the protagonist, has branched off into an additional line of Stink stories which put her little brother in the spotlight. As this is the GuysLitWire blog, I'll put him in the spotlight here today as well. The Stink books are easier and shorter than Judy's, and they make a great stepping stone between easy-to-read/beginning readers and "real" chapter books. Plus, the Stink books have comic panels between chapters that are drawn by Stink himself! (That's what I tell young readers. The art is really by talented illustrator Peter Reynolds.) There are also books that are Judy & Stink books, giving each of the siblings equal time as (third-person) narrators. 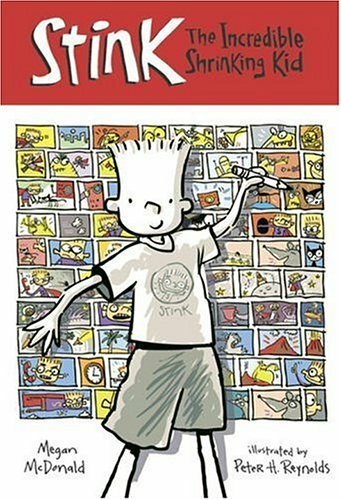 In his first book, Stink: The Incredible Shrinking Kid, he deals with the fact that he's short. Three-foot-eight, to be exact. No, wait -- His most recent height-check marked him at three feet, seven-and-three-quarters inches! Is he shrinking?! In this book, as in those that follow, Stink's concerns are age-appropriate and his antics will make readers giggle. Like his sister, Stink is adventurous and curious. Put these books in the hands of kids who aren't quite old enough to read Diary of a Wimpy Kid but are ready to start checking out chapter books! Nearly five years ago, on August 25, 2006, as a result of a vote at the meeting of the International Astronomical Union, Pluto lost its status as a planet. Sure, people had recognized the oddity of Pluto since its discovery by Clyde Tombaugh, but while "it looked and behaved like no other planet known, there was not other way to classify it, so it became accepted as the ninth planet." So how did we get to the point at which Pluto's planetary status was questioned? I'm in a frenetic mood -- mode? -- this week, as I get ready to leave L.A. for a spell to teach, or, really, facilitate a fiction writing workshop at the Sewanee Young Writer’s Conference, at Tennessee’s University of the South. I’ll be there a couple of weeks, with aspiring scribes who are the age of most YA readers, and who want to grow up and write the stuff. Fictional stuff. Be storytellers in an age that is simultaneously overrun with stories that keep us stuck in place, and far too few that seem able to guide us through the precipice. And while I've been reading up for the class (and discovering a few surprises I'll be writing up here in the months ahead), what is that we mean by being "a writer" anymore? Does it mean making books? After all, if the implements you use affect what (and how) you write, so too the implements on which you read. Yes? The quote is from writer Michael Ventura, who’s written a couple screenplays, underappreciated fiction, and who works most often as an insightful, usually brilliant, essayist. He did this for years as a columnist for the LA Weekly, and now plies his trade for the Austin Chronicle.Ventura was writing, in “The Tools of an Animal,” about how different implements affect the texture of one’s work -- the very way the words are realized on “the page,” whether a literal one or an electronic construct. Writing by pen creates one sort of pace, a certain kinesthetic relationship to the work, whereas, he notes, using a typewriter causes a different relationship between teller and tale. And finally, composing on computer keys creates yet a different music to the words. You might have the same story in mind approaching each type of tool -- yet it will come out differently, even if subtly so, depending which one you choose. When writing long-form fiction, I mostly compose on “screen” now, though often hand write drafts of scenes on backs of scrap paper when I’m “stuck.” So I blend handwriting with the keypad. Does it work? I think I’ll know for sure when I finish my own two current books. But if you grow up reading a lot of books, you get used to the way a page scans, the rising and falling rhythms of a “chapter,” and how those chapters fall together in a sequence. If you read on a screen, and are used to flicking pages with your finger, the -- that word again -- kinesthetic sense of the story will be different for you. Not “worse” -- but different. If you’re writing a “flashnovel”say, - with installments delivered to your Smartphone (as they do in Japan) -- do actions rise and fall in the space of whatever text fits on a screen? You learn to write, in part, by what -- and how -- you read. Consider movies, which we’ve had more than a hundred years now. Originally, films were essentially recorded versions of stage plays. Then someone -- D.W. Griffith? -- realized you can move the camera, and you have “the close-up.” And suddenly film takes on its own language, which in turn is ratcheted up by the pace of TV, then music videos, and now, perhaps, by everything you watch online. All of which affects narrative everywhere else, including, of course, what we mean by “book." And now that books are more frequently sharing the portable screens we watch those same movies and TV shows on, even the idea of “book” is changing, even if no one can quite name what it's changing into. We haven’t even discussed how voice recognition software might further change the act of composition. Meanwhile, I’ll report back from Tennessee about what teaching fiction to the intended audience for most of the stuff written up here, is really like. Ba and Moon are twin brothers from Sao Paulo, Brazil who have created some wonderfully introspective graphic novels. 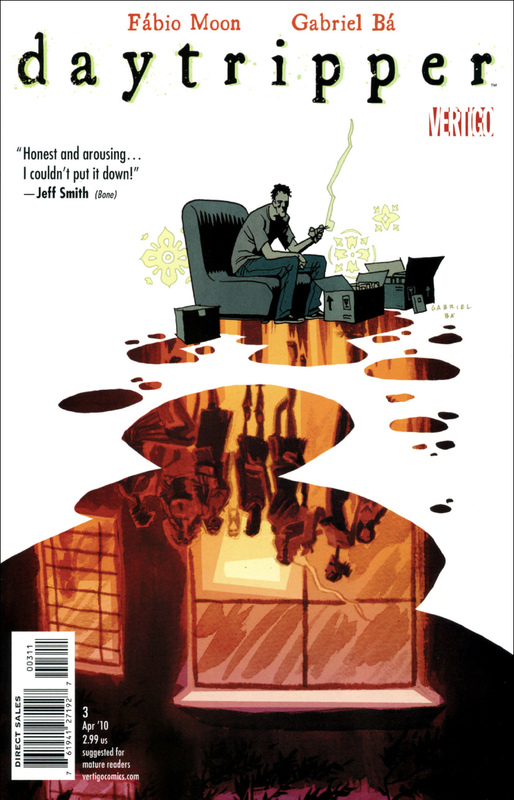 De:Tales, from 2006, is one of my all time favorite graphic novels and their latest is Daytripper. Daytripper follows the life of obituary writer Bras de Oliva Domingos. Each chapter is a day in another year of Bras' life and how he might die. At the death of each age (33, 21, 11, etc.) a portion his obituary is included. Bras, nicknamed "little miracle" by his mother due to circumstances surrounding his birth, finds himself working at a newspaper when he really wants to become a novelist like his father. It takes a tragedy at the local airport and the fear that something has happened to his best friend Jorge for Bras to finally stretch himself as a writer. Bras is shown making mistakes, sharing triumphs with his family and experiencing many quiet, yet poignant and important moments. Life is made of these moments, son. Relationships are based on such moments, such choices, such actions...and that's the one moment I will carry with me after all others fade -- The one which makes all others worthwhile. You should look for such moments in life, son. Moments you'll never forget. Daytripper is an incredibly ambitious piece of work chronicling the life of someone working through what it means to be a man, a son, a husband, a father and a friend. I found myself becoming disappointed at the end of each chapter as Bras dies, even when I knew it was coming. Daytripper is an ultimately hopeful, compelling look at life with the interesting country of Brazil as its backdrop. Fans of graphic novels such as Blankets by Craig Thompson (who wrote and drew the introduction to Daytripper), Cairo by G. Willow Wilson and the Flight anthology (especially #4 which includes Fabio Moon's story Cortina) will enjoy Daytripper or anything else by the twins. Ah the apocalypse. Will we ever get tired of reading about you? 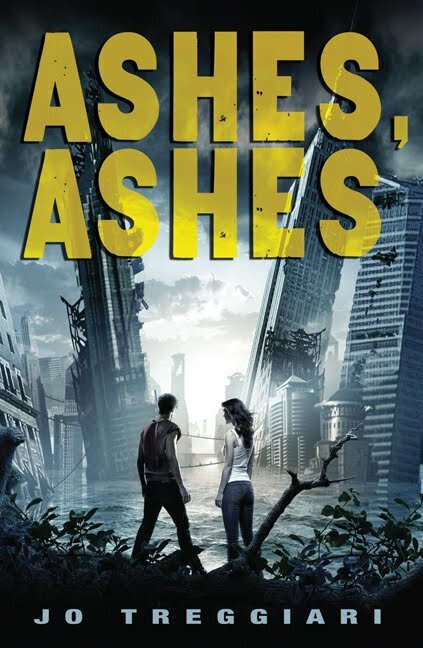 These days, you can't turn around in the YA section of the bookstore or library without a posse of post-apocalyptic tales vying for your attention. "Hey, check me out! I'm tough! I'm thrilling! I'll give you all the doom you've ever dreamed of!" 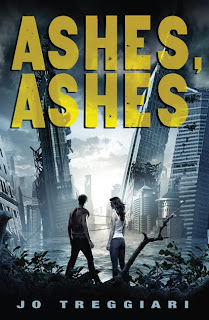 Jo Treggiari's new novel, Ashes, Ashes, is likely to find its way into the hands of doom-lovers, and I doubt they will be disappointed. Treggiari's story gets in just about every nasty end-of-the-world scenario you could imagine: epidemics, floods, and droughts have combined to deliver the end of the world to just about everyone. 99% of the planet's population is gone. Lucy, our heroine, is one of the few survivors. She has been living in what used to be Central Park, barely making it by foraging and hunting. Events conspire to pull her from this isolated existence. She joins with a group of other survivors and soon after, it becomes apparent that they are not safe. A mysterious army known of "Sweepers" is coming after many of those left behind, stealing them away to an unknown fate. Lucy and the others must fight to find their way towards some kind of future together. Recently, Leila reviewed the Loveless collection. In the comments, I noted how much I had loved the series when it was coming out. In response, she asked about some other "Western Westerns." I, like a jerk, failed to respond. Instead, I'll just blog some of my favorite western graphic novels. 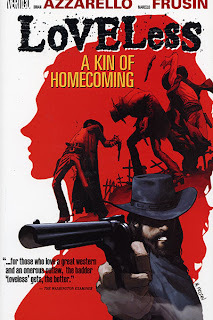 I've done this before, reviewing True Grit and The Hawkline Monster, but comics have a long tradition of great Western stories, so this time I'll focus on those. I am soooo grateful....THANK YOU for partnering with us. I wish I could hug each and every one of our givers!!!! I am so delighted that I was a recipient of the book sales. It was a pleasure to see the smiles on my students faces as they watched their collection grow!!!! The fair accomplished so much - and had such a positive impact on Ballou that we are moving forward with a plan that I've been hoping to initiate for a long time. Melissa is receptive to the idea of GLW returning to Ballou in the future and we would really like to have a longterm relationship with a school so that the librarian could rely on us for more popular titles and use their own funds for more selective items to build their collections (like the pricey and hard to come by reference section stuff). We are planning to run a small fair in November (taking advantage of everyone's holiday spirit) and will return in the spring with another big list of titles to help get Ballou further along the way to having a full, viable library. (Keep in mind they still have a long way to go.) Our hope is to have a lasting influence on both the school and the students; we'll keep you posted on how things go. Mostly, though, we here at Guys Lit Wire just want to thank all of your for coming through so brilliantly with this project. You proved yet again that the world is a good and wonderful place and there are a lot of kids (and one happy librarian) who will never forget your generosity. Katherine Tucker Windham, a historian and storyteller, passed way this Sunday. She was known for collecting and preserving southern folklore, especially in her book 13 Alabama Ghosts and Jeffery and its sequels. While most people outside the south have never even heard of Katherine Tucker Windham, I can't imagine what growing up in Alabama would be like without her. Windham was born in 1918 in Selma, Alabama. She started writing when she was 12, reviewing movies for her uncle's small paper, The Thomasville Times. After college, she went to work from the Alabama Journal, becoming one of the first female police reporters in the country. In 1966, Windham moved into a house haunted by a ghost they named Jeffery. According to her family, Jeffery could be heard walking around seemingly empty rooms and occasionally moved object around. Windham became interested in other hauntings and eventually wrote her first book, 13 Alabama Ghosts and Jeffery, collecting ghost stories from around the state. It became a hit and was followed by 13 Georgia Ghosts and Jeffery, 13 Mississippi Ghosts and Jeffrey, Jeffery Introduces 13 More Southern Ghosts, and several others. Billy Collins has quite a reputation among U.S. readers of poetry as a somewhat folksy, wry sort of poet. He draws large crowds for his readings. He sells large numbers of his books. And all of it, I submit, is well-merited, since he has the knack, like Robert Frost before him, of speaking his poetic truth - however erudite or deep it happens to be - in such a way that most people can catch at least one meaning of the poem - the surface, at least, whether they choose to look into the depths or not. It's kind of crappy audio quality, but you can hear Billy Collins read this poem here if you'd like. I like reading nonfiction because I can learn things. Some of my favorite books are obviously labors of love. The Sibley Guide to Birds is a perfect example. 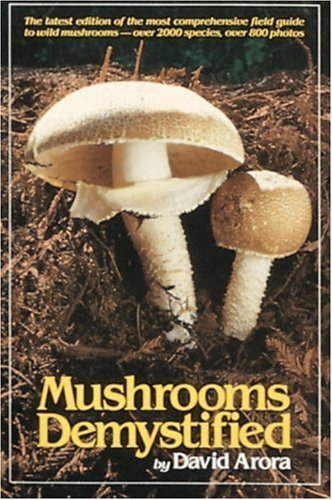 And so is David Arora's Mushrooms Demystified. Though too big to be a field guide in the sense of fitting in a pocket, it is there (in the car or, more likely, at home) to consult if I find a fungus I'm not sure about (Mushrooms are fungi.). Though most Americans (and Brits, too, apparently) are afraid of wild mushrooms, many of the world's people are not. In Russia, there are trains that make runs out to good mushroom hunting areas. Bunches of people go every year. Mr. Arora explains how to figure out what sort of mushroom you're looking at. "Fungi can be divided into three categories based on their relationship to their... environment. Parasitic fungi feed on living organisms... Saprophytic fungi subsist on dead or decaying matter... Mycorrhizal fungi... form a symbiotic relationship with the rootlets of plants (mostly trees)... The rootlets provide the fungus with moisture and organic compounds, while the fungus aids the roots in the absorption of phosphorus, inorganic nitrogen, and other minerals, and apparently also provides added resistance to certain diseases." I don't believe in summer reading. That is, I am not convinced that the generally accepted notion behind the "summer slump" that in order to prevent lost ground between school years requires a designated program of required reading. Where there are studies that prove that summer reading is beneficial I have seen just as many that say the difference they make is marginal at best. There are those who argue that without summer reading programs kids wouldn't read on their own, which suggests to me that we have done something gravely wrong in the way we have raised our kids if given the chance to read whatever and whenever they wanted they chose not to. Ironic, perhaps, that the very people most concerned with reading seem to drive kids and teens away from it in such a way that they have to resort to forced regulation. That said, I'd now like to offer some suggestions for alternate summer reading. I realize that might sound like I have just contradicted myself but what I want to offer is a different approach to the idea of what summer and reading can provide without a sense of the school year running year 'round. If the school year brings students in contact with the subjects and curriculum that society agrees is important I'd like to suggest that the summer be a time where the reader explores a world outside the classroom, a world of choice. Though there are an endless number of topics one could discuss, I'd like to present three subjects whose books could serve as textbooks for an alternate education in film, cooking, and a catch-all of casual musical diversions that are as much for fun as they are personally gratifying in their accomplishment. A dedicated summer reader could turn any one of these into an education as rewarding and valid as any topic learned during the school year. As I sat through my nephew's graduation ceremony this past weekend, I got a little emotional. It wasn't the sweetly hopeful faces of the graduating seniors that got me, or memories of my own misspent youth, or even thoughts of the day my children would walk, cardboard square be-capped, across that stage. It was, instead, a sense of injustice, a sense that I'd been slighted. "Hey," I fumed, "why hasn't anyone ever asked ME to deliver a high school commencement address?" Ok, so I never had the drive to graduate anywhere near the top of my class, and I don't have the acclaim or distinction that would prompt anyone to ask for my insights. Still, I'm smart. Some might even say wise. I have life lessons to teach. 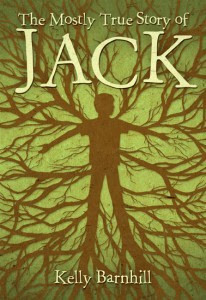 I met Kelly Barnhill in the airport following the World Fantasy Convention, and she was kind enough to give me an advance copy of The Mostly True Story of Jack. It doesn't come out until August, but it should be on your radar because it's a wonderful folk tale dressed up in modern clothes, with a collection of great characters and a terrific central conceit. If you're a fan of westerns with a clear moral compass, Loveless is probably not the story for you. If you aren't a fan of westerns, don't write Loveless off just yet. It's a western through-and-through, but it feels more like a noir story -- more than any other, it reminded me of Dashiell Hammett's Red Harvest. If you found Deadwood too violent, too profane, too dark or too explicit, you might want to give Loveless a pass. If, however, you loved Deadwood and mourned its all-too-sudden passing, well then. Read on. Labels: Graphic Novel , Survival , War - What Is It Good For?